It's definitely a good idea to display safety posters in your workplace. 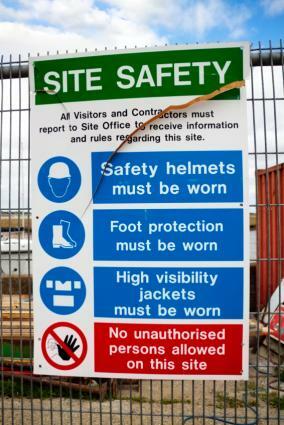 Posters can serve as important reminders of the do's and don'ts of staying safe at work. They can be displayed in break areas, on bulletin boards where employee announcements are posted and in work areas. Download one or more of the free printable posters provided here to use in your place of business and find out where you can get access to additional no-cost safety-related graphics to display. You can download and print the three images below to use in your workplace. Simply click the image that you want to download to get started. An 8 1/2 X 11 version will open in PDF format. If you need help downloading the posters, check out these helpful tips. With so many people multitasking throughout the workday, it's no surprise that a lack of focus can contribute to workplace injuries. This poster can help remind your employees of the importance of staying focused and alert. 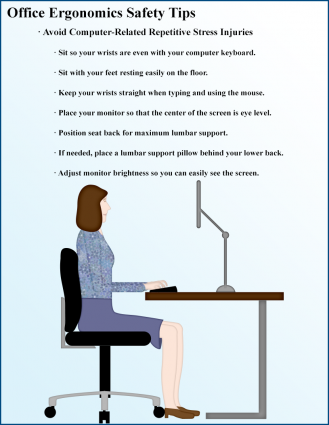 People who spend a lot of time sitting in front of a computer need to apply proper ergonomic principles when arranging their work stations in order to reduce the risk of developing repetitive stress injuries. Display this poster in an area where it's visible to office workers. 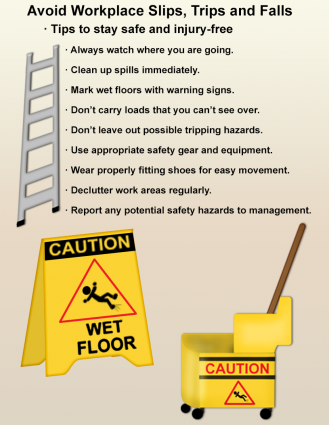 It's impossible to be too careful when it comes to educating workers about how to avoid slips, trips and falls in the workplace. Display this graphic where everyone in your place of business is likely to see it. Occupational Safety and Health Administration (OSHA): Visit the OSHA website to get a free copy of the "Job Safety and Health: It's the Law" poster that employers are required to display. You can download a printable version of the poster directly from the website or request to have a printed version mailed to you. Call 800-321-6742 to order a poster or place your order online via the OSHA Publications page (where you can also order other free safety-related materials). The poster is available in English, Spanish, Polish and Portuguese. Note that the Polish and Portuguese versions are only available via online download. 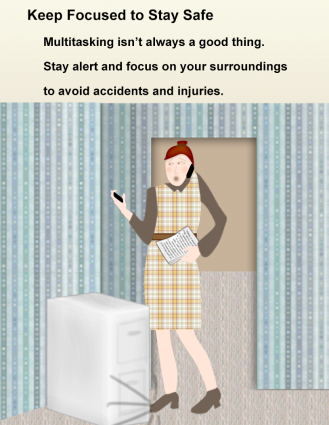 New York State Insurance Fund (NYSIF): Visit the NYSIF website for access to a number of free safety posters that can be downloaded and printed. There are a number of general options, such as first-aid, office safety and electrical safety, as well as industry-specific posters for restaurants, healthcare organizations, construction companies and more. Posters are available in English and Spanish. Alberta Agriculture and Rural Development: The Alberta Ministry of Agriculture and Rural Development has a number of free printable posters specific to the topic of agricultural equipment safety. These cartoon-style posters provide important safety messages that could be beneficial for companies that utilize farming equipment. As part of an overall safety program, displaying relevant safety posters can go a long way toward promoting top-of-mind awareness for important workplace safety issues. Strategically placed visual reminders designed to help keep workers focused on important safety concerns can help prevent many occupational injuries.